Miracle Gro compost – ‘Best by test’? Scotts has been asked to remove an advert for its Miracle-Gro Organic Choice Peat Free Compost from its website, Love the Garden. The ad claimed that ‘Miracle-Gro Organic Choice Compost grows plants bigger than leading peat free products!’. However the ASA received a complaint about the ad, which said that the claims made were misleading and could not be substantiated. In 2011, this compost was a Which? Don’t Buy in the Which? annual compost trials. Scotts said the claim was based on the results of two independent trials, undertaken in 2009, which compared the Miracle-Gro compost with competing peat-free composts. The trials were conducted on tomato and petunia plants. However the ASA said that the preceding claim, ‘it is proven to grow stronger, healthier plants, fruits and vegetables’ implied that it had been tested on a wide range of fruits, vegetables and plants. The ASA also said the the ‘independent’ trials implied that the compost had been trialled against all leading peat-free composts, which was not the case. It added that consumers would believe that ‘leading’ meant ‘best performing’. The ASA only deals with issues concerning advertising, not the packaging of the product. Compost quality can vary hugely, and every year, Which? independently trials a large range of widely available peat-based and peat-free composts to find the best. 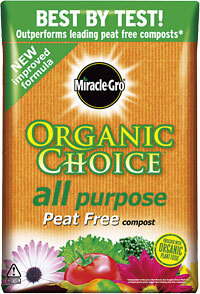 In 2011, Miracle-Gro Organic Choice Peat Free Compost was named a Don’t Buy after it performed poorly in our trial. It has since been reformulated, and we have included it in our current compost tests. The results are due to be published in early 2013. To find out which peat-free composts really are worth buying, read about our Best Buy composts.